You might find that your TV is being overloaded with inputs from cable, games consoles, surround sound systems and so on and you might not have enough HDMI ports to house everything. The solution is to use an HDMI splitter or an HDMI switcher – these are neat little devices which can allow you to connect more devices by running one HDMI cable to your TV and then plugging your other HDMI cables into the unit. 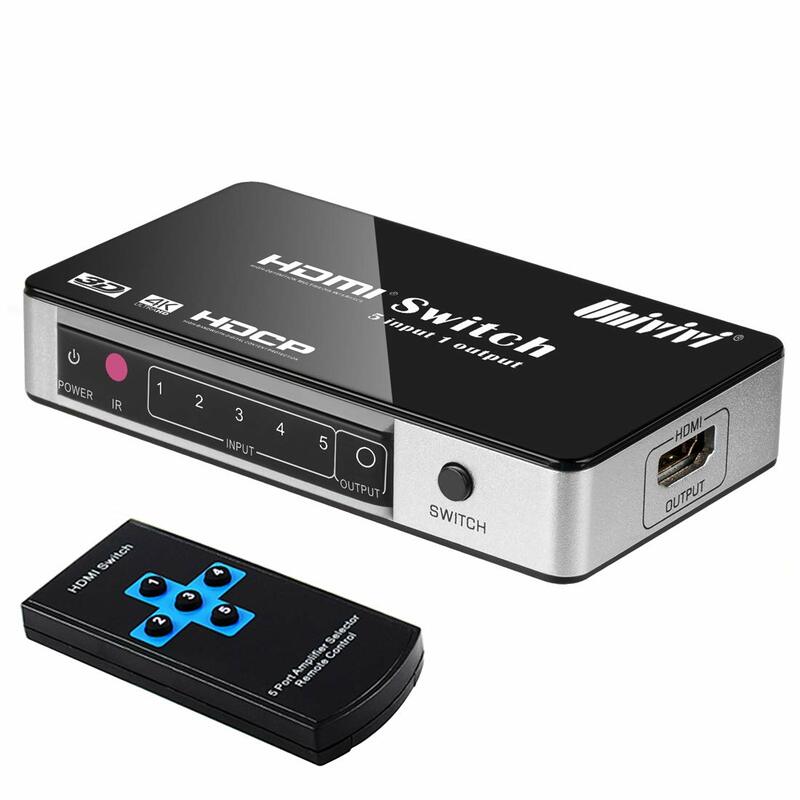 HDMI switchers allow you to swap source at the click of a button, most of these will also include a remote so you can change sources using that also. Another reason to use a switcher is to tidy up your cables, you can run one HDMI cable to your TV which can be concealed within the wall and then plug all your other devices in, this makes sure you dont have a nest of cables running to your TV. It also allows you to situate your consoles, DVD players away from your TV itself. In this guide we will be taking a look at all the best options available, to suit all budgets. We have tested many devices out and hand-picked the top options, read on as we review each one in detail and list the pros and cons of each. Skip to the bottom of the post for the FAQ and a complete Buyer’s Guide to help you make your mind up. 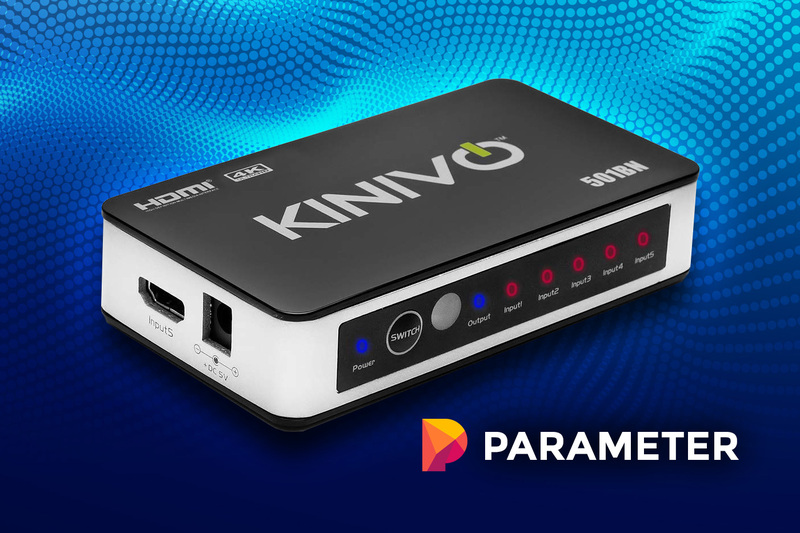 Best overall – with 4K resolution, 3D graphics capacity, large device compatibility, and easy setup, the Kinivo 501BN 5-Port High-Speed 4K 30Hz HDMI Switch is the top choice for most users. 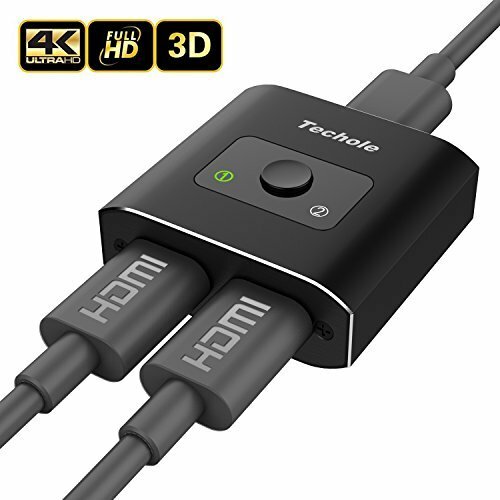 Best budget – the Techole HDMI Switch 4K HDMI Splitter is a reliable solution for those who don’t want to spend too much on their device. Best premium – made with a metal heat sink design which includes a serial RS232 port, the E-SDS UHD 4K HDMI Switch is the best quality option. 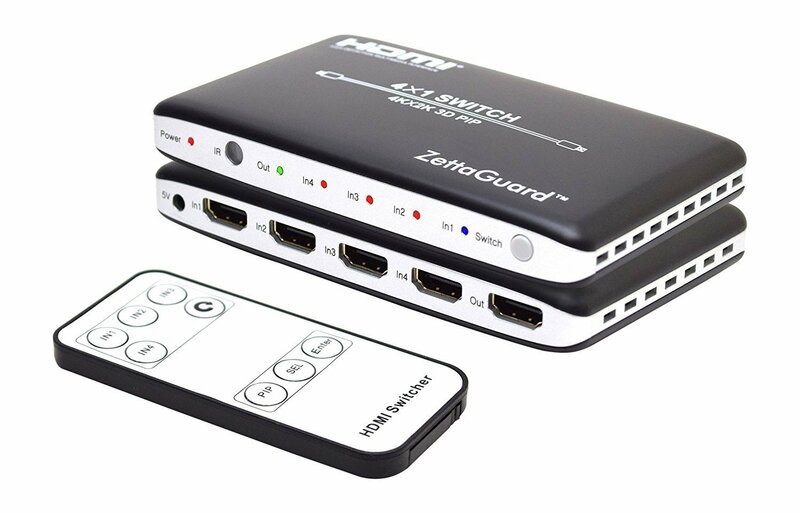 Best value – the Zettaguard 4X1 HDMI Switch offers balanced performance with 4K video and picture-in-picture features at a reasonable price. This simple HDMI switch is one of the reliable releases to connect up to 5 devices such as gaming consoles or laptops to the TV. As a result, it is a declutter design which can simplify the entire network of cables which run towards a TV. 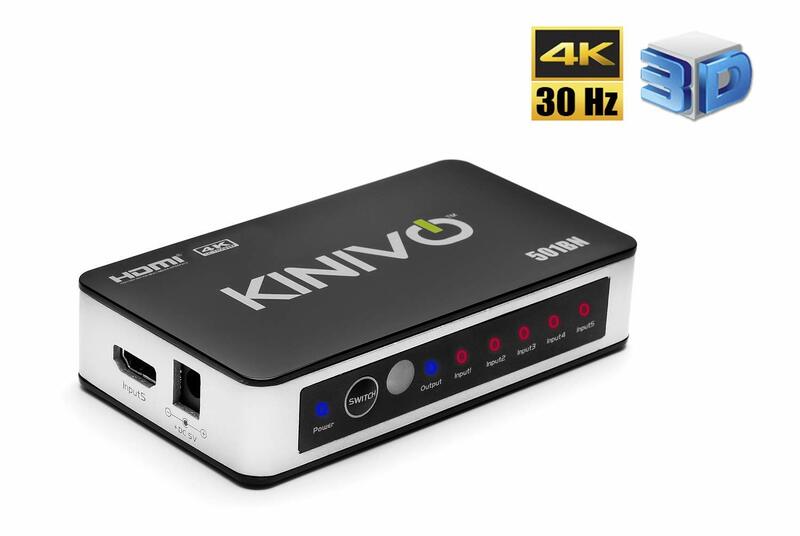 Inside the pack, users get the Kinivo HDMI switch, an IR remote control, an AC power adapter, and the user’s manual. But the true strength of the HDMI switch comes in its performance. The star feature is its 4K video capacity at 30Hz. This video quality is, in fact, the same to what is offered by some of the most expensive HDMI switchers and splitters. In terms of image quality, it is able to reproduce vivid colors and lifelike photos and images. The HDMI switcher also supports 3D technology. Playing top-rated games on consoles such as PS3, PS4 or Xbox comes with impressive graphics, just as gamers would hope for. With deep color up to 36-bit, the data supported by the HDMI switch caters both TV images and 3D graphics. The good news is that the HDMI switcher is not limited to the devices it can work with. This includes popular PlayStation consoles, Xbox consoles, BlueRay players, and all versions of Apple TV. Up to 5 different or similar devices can be connected to the splitter. A simple device map can include a gaming console, a cable box, a Roku, a BlueRay player, an Apple TV connected to the splitter and then out to either a project or an HDTV. Using the HDMI switcher even when all ports are used is not complicated. The automatic switch function also works in favor of the user. It actually detects the device in use and it makes it the default option for the switcher. Of course, if there are multiple active inputs than the user can select which of those inputs is transmitted as an output. This is either done via the IR remote control or using the manual select button on the switcher. The good news is that even with these automatic functions, the switcher can handle heat very well. For this reason, it is actually made with a hybrid aluminum body. This body allows proper heat dissipation. Even when used for hours, it handles data transfer without overheating. As one of the compact HDMI splitters, the DotStone design manages great results when it comes to full compatibility with TVs and various consoles. The bi-direction HDMI switch can connect two HDMI inputs to a TV. With no extra devices needed, controlling the input HDMI cables is easy. There is a simple switch button which users can press to change the input to the TV. One of the key features of the compact HDMI splitter is found in its 4K compatibility. Supporting a capacity of 30hz, it is as qualitative as users hope for. Of course, this also means the splitter handles 3D and 1080p video quality. But even the sound quality is impressive. There is no loss in sound quality during the data transfer process. When it comes to using the HDMI switch, there are no major worries for the users. With a reach of up to 16 feet, the switcher still manages to offer lossless video and audio quality. This is, of course, when the cables maintain their 3.4Gps constant bandwidth. It also means that the long cables can reach most devices. This can include consoles such as PS4 or Xbox as well as projectors and TVs. A unique advantage of this small HDMI switcher comes with its plug-and-play design. Practically, it needs no external power which means it is fast to connect and it comes with fewer cables. But the switcher is also a top purchase for those seeking a future-proof design. One of the reasons for the claim is the fact that it comes with a few interesting certifications. With FCC, ROHS, and EMC certifications, the switcher is reliable. As a result, it is even covered by an 18-month product warranty. A concern which might be particular to gamers comes with a lag. But the good news is that there is no lag with the DotStone switcher, even when playing the latest games. With such a compact design and a plug-and-play design, it is a hit for many gamers or those seeking to connect a PC to the TV. 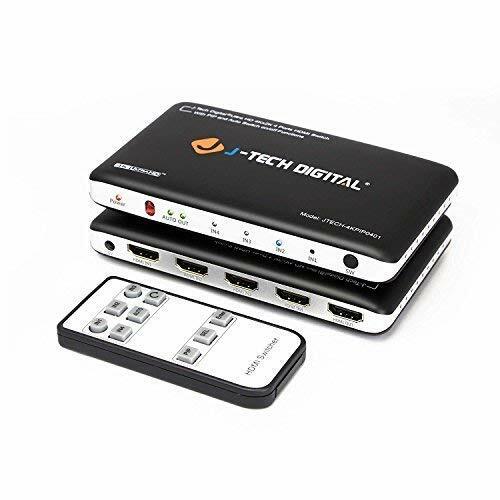 This HDMI switch is known for its high-quality image transfer to a TV from most compatible devices. It supports 4K and 2K resolutions which mean it can also be considered for some of the most modern TV sets of the moment. In order to set up the switcher, it first needs to be connected to a power source. The input devices handled can be up to 4. But the good news is that transitioning between these devices is very easy. Using the remote control, users can simply press on the number of each specific input to change the output to the TV. For this purpose, a picture-in-picture functionality is also in place. This feature allows users to actually display multiple devices on the TV screen. Users can then select the device they want to display in full screen, with a smooth transition. This feature works with 3 sub-screens and 1 full screen. Even more, it can be considered for practicality purposes. So the feature allows users to check their emails or see an updated on their favorite sports game while watching a movie. This can be done via the remote control, without actually having to leave the seat. 3D graphics are also supported by the switcher. Gamers can use the device to input their favorite games and play on the TV screen for a more immersive gameplay experience. With a supported depth of color of 30bit, 36bit, and 48bit, the switcher handles even the highest quality images. Even watching lower resolution 1080p HD videos on the TV or projector is possible with the switcher. At a power consumption of 1W only, there are no reasons to dismiss it even when playing or watching movies for hours and hours. Another interesting characteristic comes with the included LED status lights. When all 4 HDMI cables are connected, the red LED light is on. If one of the HDMI inputs is selected as an output, its corresponding LED light turns blue. So even when there is not too much visibility in the room, users can still tell if the cables are connected correctly. Supporting full 4K resolution, the HDMI switcher works with a maximum number of 3 inputs. It stands out with its 4K capacity as it can work with a 60Hz capacity even when connected to a 1080p video output. It even supports all types of audio formats, especially Dolby Atmos and DTS:X. The switcher is compatible with HDR devices. These include Samsung SUHD HDR + HDR-1000 and the LG Super Ultra HD HDR 10. These devices can also benefit from cables lengths suitable for regular or large rooms. Possible cable lengths for 1080p video quality include options up to 25m. 4K video resolution comes with shorter cable lengths of up to 10m. An advanced feature of the HDMI switcher is the auto console switch when the signal is detected. It means the console is used is the one which is automatically sent to the video output and the TV. It is why actually using the included remote control is not as frequent and many people would expect. The included remote control might actually only be used when multiple consoles are switched on. The good news is that these automatic switches are fast. They are also smooth so they don’t take too much away from the user experience. 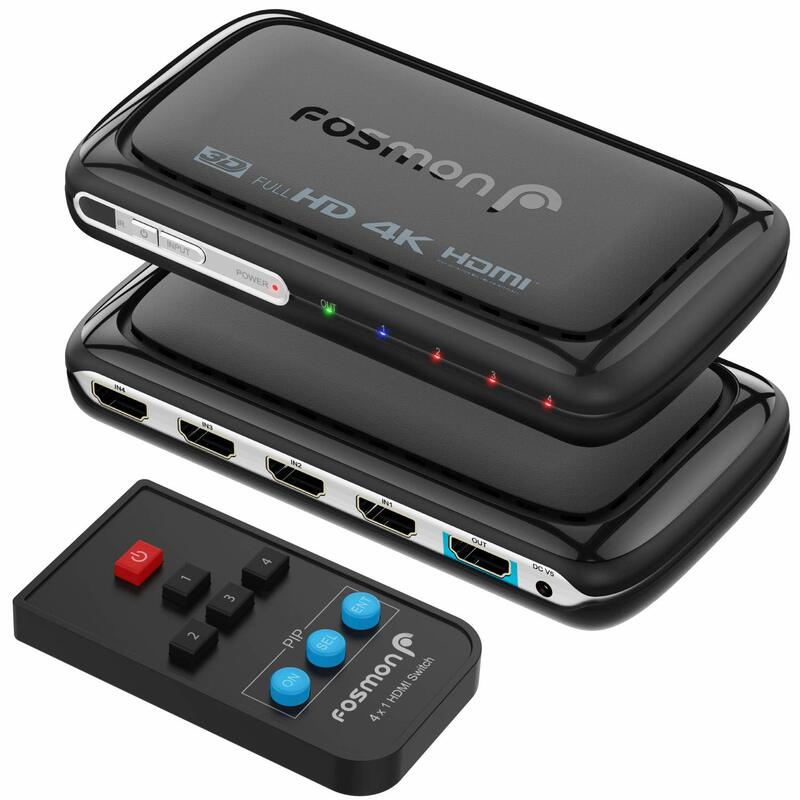 With full HD support, the Fosmon HD1832 Intelligent 5×1 5-Port HDMI Switch is among the options to consider for those who don’t need 4K capacity. As one of the most affordable splitters, it can be a fast solution for those who are not specifically into tech or who don’t want the highest resolution. At the same time, TV sets which don’t offer 4K video quality can benefit from the splitter as well. Up to 5 HDMI inputs can be connected to the splitter. Although it is marketed with 6-cable pictures, one of them is the actual output cable. All of these inputs support 12-bit deep color per channel. There is a maximum of 36-bits across all channels. As an interesting addition, the golden-plated 24K ports can add to the durability of the splitter, especially if the HDMI cables are connected at disconnected often. The splitter also comes with an infrared remote control. It offers users the possibility of actually setting their own output device, even without living the comfort of the sofa. The remote control is very simple and probably the easiest to use when compared to its alternatives. It only has 4 buttons. Each button is assigned to an HDMI input. The splitter also comes with the major advantage of a plug-and-play design. There is no needed power connectivity and the splitter works immediately. The key here is that it actually uses sufficient power from the connected devices. Users can also find it easy to troubleshoot basic problems. For this purpose, they can simply check if the corresponding green LED light is on for each HDMI input. Easily switching between 5 HDMI sources may be all that’s needed for those who want to make the most of a splitter. The E-SDS design is made to a high standard even when compared to more expensive alternatives. Supporting 4K video quality at 60Hz makes it a valuable option for those with TVs of the latest generation. Full HD videos are supported as well, together with 3D graphics for realistic games. With a constant bandwidth of 15Gpbs, the switch is reliable as long as the HDMI cables are not too long. Standard audio quality is supported as well. But the splitter also works with Direct Stream Digital and HD audio. Furthermore, it is also one of the few switchers made with an RS232 multi-purpose port. But unlike many other splitters, it also comes with a construction quality to remember. Made with metal casing, it handles all types of video demands, even when all ports are in use. The result is that it maintains a manageable heat as it offers better heat dispersion. In order to install the HDMI switchers, users need to find the closest power supply. Once the splitter is connected, it can be fully controlled with the help of the included remote control. But the biggest advantage of the splitter remains its serial port connectivity. It works with all other devices which have such a port. This includes computers, consoles or video projectors. One of the issues of the splitter came in the form of blackout moments when Roku was connected at a default 4:2:2. But a reset at 4:2:0 from the secret screen can eliminate this issue and ensure the device can be connected to the splitter without any loss of signal. The switcher is recommended for those who want to have the ability to turn the auto-switch function off. Since this can be an issue for many users, even with leading designs, this function alone can propel the HDMI switcher towards the top preferences for the ultimate control. The function is optimized to offer practicality. When the switcher is turned off, it will remember the latest in-use device when it powers back on. When the auto-switch option is turned off, the user has all the control of the output device. But the switcher also comes with other advanced functions such as the picture-in-picture functionality. It is practically a preview of all connected devices. Users can easily switch between DVD sets and gaming consoles based on this feature. Up to 4 different devices can be connected to the HDMI switch. They could be a computer, an Apple TV, a PS4, an HD source or an HD player. All of them can be among the top-quality image resolution designs of 4K and 3D graphics. The remote control can also be a friendly solution when all ports are used to make switching easier. Another area where the HDMI switcher is user-orientated comes with its LED light. Starting from the left side of the switcher, a red LED light is on while the power cable is connected. The auto-switch function indicator is next. Whenever the splitter is connected to an output device such as a TV, a green light is on as well. All connected HDMI devices also have their own attributed LED lights. A physical switch button is also available. It can be used in case of user lose the remote control. Users looking for an elegant switcher can find Univivi’s design to be a tempting option. Made with a distinct piano black finish, the switcher is among the most durable designs in its class. It has an aluminum frame, a material which is known to cool quickly and which is suited for multiple hours of work per day. But the switcher also comes with 24K ports. These coated ports are known for their corrosion resistance. Fighting against natural oxidation, they reduce tarnish and practically increase the durability of the switcher. With a robust design, the device can be considered as a durable option which can be used in commercial spaces as well as at home. It handles up to 5 HD sources and it can considerably reduce clutter and all the cables which would be associated with TV connectivity without it. But when it comes to actual video performance, it is made to the same high standard as its physical case. It represents a top option for 4K video quality at 30Hz. Supporting ultra-HD video quality, it is recommended for better video quality, even when connecting a console such as the Xbox One. The switcher also comes with other advanced functionalities to make the life of the user easier. The auto-switch option automatically detects the device in use and it sends its signal towards the output port. Manual selection is also easy through remote control. Each button on the remote control has been attributed to an HDMI port. When it comes to practicality, making a switch is straightforward. When auto-switch is the option, the device will set the currently active input as active. A manual switch can be activated by pressing its assigned button on the switcher and selecting the exact input. On top of these methods, the IR remote control method can be used as well. Without a doubt, the distinctive characteristic of the Techole switch comes with its size. Even if it only handles 2 HDMI inputs, it still remains a practical design which doesn’t require too much space and which can be easily hidden away from sight as a result of its compact size. Being a compact splitter, it needs a power supply. This can be considered by those who don’t have an immediate wall outlet to use power for most alternative HDMI switchers. With a stable transmission, the HDMI switcher can be considered for all types of uses. From a desktop computer connected to the TV together with a laptop or from a PlayStation console connected to the TV with a BlueRay player, it can serve multiple purposes. The compact HDMI splitter supports jaw-dropping image quality at 4K resolution. Even playing games through the switcher still comes with impressive graphics and resolution. 3D graphics are supported. When watching lower resolution videos but still in HD quality from online sources such as YouTube or Vimeo, the switcher still does each video justice for its impressive quality. The design itself speaks about the compact nature of the splitter. But the good news is that even with such a small body, Techole has still managed to include a few must-have physical characteristics. One of them is the actual switch button which allows users to select their preferred input. But the switcher also comes with a green light signal for the input which is in use. Made from aluminum alloy, the switcher is among the most durable options in its class. It represents a viable option for those who always want their tech products to look great and the emphasis on aesthetics has been worth it in the end for the switcher. Since the product offers impressive quality, this is also seen in the actual product warranty. It is one of the few products which offer a 24-month extended warranty. 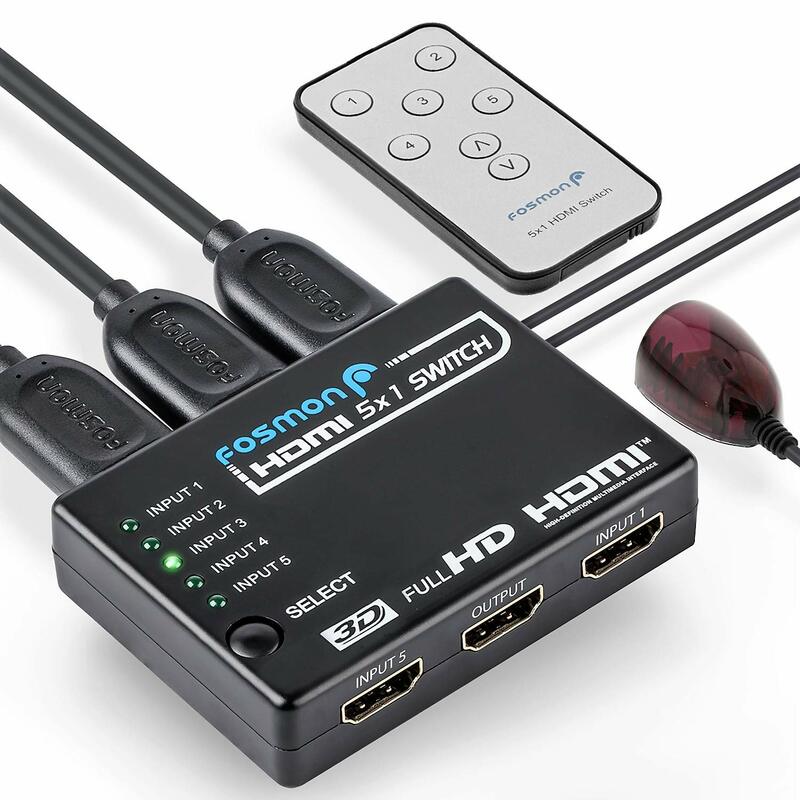 Reasonably priced, Fosmon’s HDMI switch comes to address some of the issues this category of products is associated with. As most users expect, its aim is to offer stable circuitry. It means there is no loss of signal, no blackouts, and no lag when transferring 4K video quality through the switcher. It also comes with picture-in-picture functionality. This feature will display miniature input windows on the main screen. However, this function is actually limited to the video quality of up to 1080p. The switcher also offers power support which can be useful for underpowered HDMI sources. Of course, its main strength is that it actually offers 4K video resolution. But it also differentiates itself on the physical side. It comes with a ventilated case, perfect for keeping its running temperature lower. Fosmon might be a relatively new company as it’s been founded in 2007. 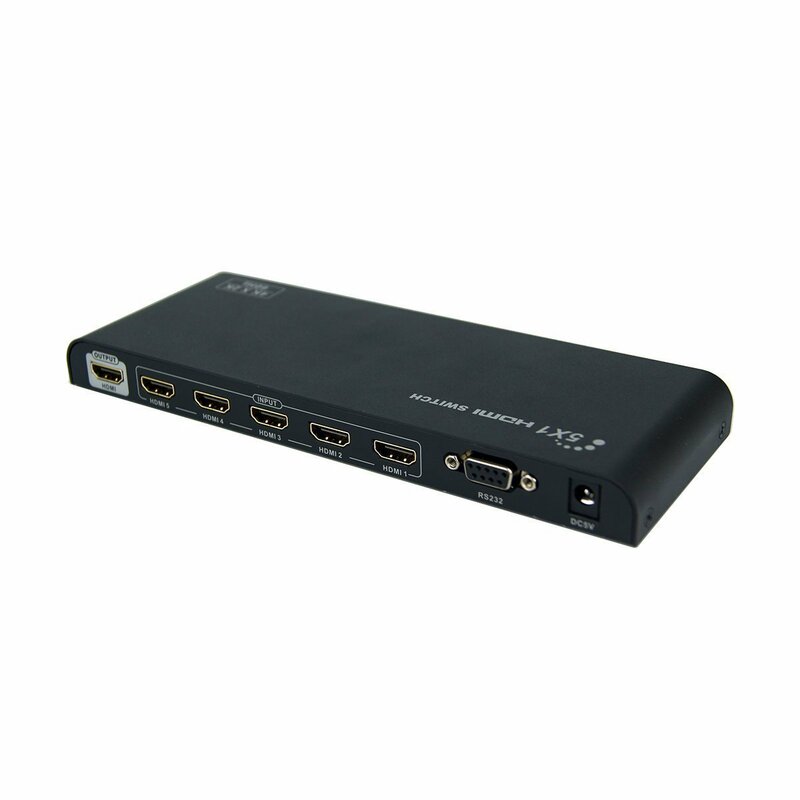 But its 4-port HDMI switch is actually useful for many users. It connects directly to all HDMI-enabled devices. They can include a laptop, a computer, a DVD player, an Apple TV, a Roku, the latest versions of the PlayStation console, the latest Xbox versions, a Nintendo Wii and many other sources. At the same time, even if it can handle up to 3 HDMI inputs, it still comes with a low weight. At 122 grams, it is virtually weightless, even with its robust casing. Users can also benefit from the added remote control which makes toggling between the HDMI devices faster and comfortable. 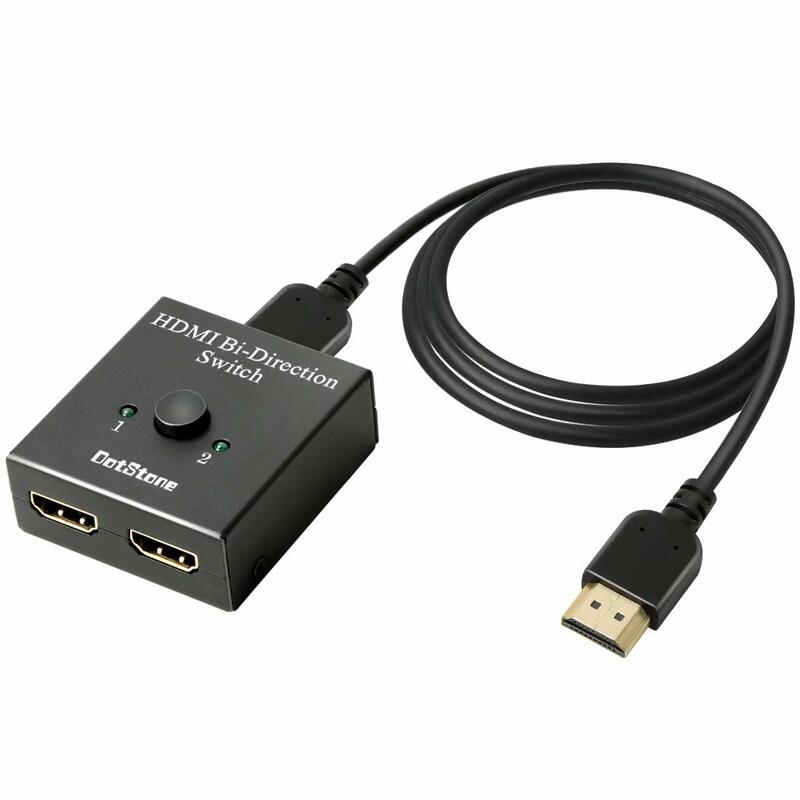 The best HDMI switchers and splitters are often chosen on the basis of video resolution capabilities. Of course, for most users, this is the most important characteristic and it can be enough for an informed choice. Other characteristics to consider include the following options. 4K, 2K, and 1080p 4K video support is not offered by all HDMI splitters. Some splitters are limited at Full HD video resolution. A way of future-proofing the purchase of any splitter is to simply choose a 4K-capable device, even if the resolution is still not needed at the moment of purchase. In other cases, 1080p video quality might be more than enough for most users. Number of HDMI ports The number of HDMI ports is crucial to a good purchase. Many people simply struggle to find this number and then find out they need extra ports. From 2 to 5 ports, there are a few splitters to consider. For a computer and a gaming console, a 2-port splitter might be sufficient. But most users can benefit from 4 or 5 ports which can connect their Apple TV, BlueRay or even their Nintendo console to the TV using a single splitter. Heat management Overheating can be a problem for devices with multiple HDMI ports. In some cases, it is the main cause of splitter failure in the future. In some cases, overheating can cause small problems such as a manual switch button malfunction. In other cases, it can cause total splitter failure. Regardless of the situation, keeping the splitter in a ventilated area is recommended. Auto-switch functionality The auto-switch function is dividing users. Some love it while others hate it. At its core, this function is actually useful. It detects the device in use and it sends its signal further to the TV. In other cases, it comes with certain problems where it even accidentally switches the output device. This problem can be tackled manually when the function is switched off and when users are in charge of their output device switch. But the problem is most HDMI switchers are not actually inclusive of a function which would turn off the auto-switch characteristic. Picture-in-picture previews This function is one of the preferred options for users who want to keep an eye on other devices. For example, the picture-in-picture function can allow users to keep an eye on a sports game when they live on a computer while watching a movie on a DVD player on the TV. Of course, both devices would need to be connected to the splitter. But the good news is that some of these functions are easily integrated into the remote control operation with a dedicated button. They are quick to use and they can be useful in certain scenarios. The problems this feature is notorious for includes lag. But since the function only works with 1080p video quality, this problem is starting to become less of an issue. Remote control operation Some HDMI switchers come with remote control operation. It might not be the most requested characteristic, but it has its advantages. For example, when a switcher is used in a conference room, the remote control can easily choose the output device or computer connected to a TV. 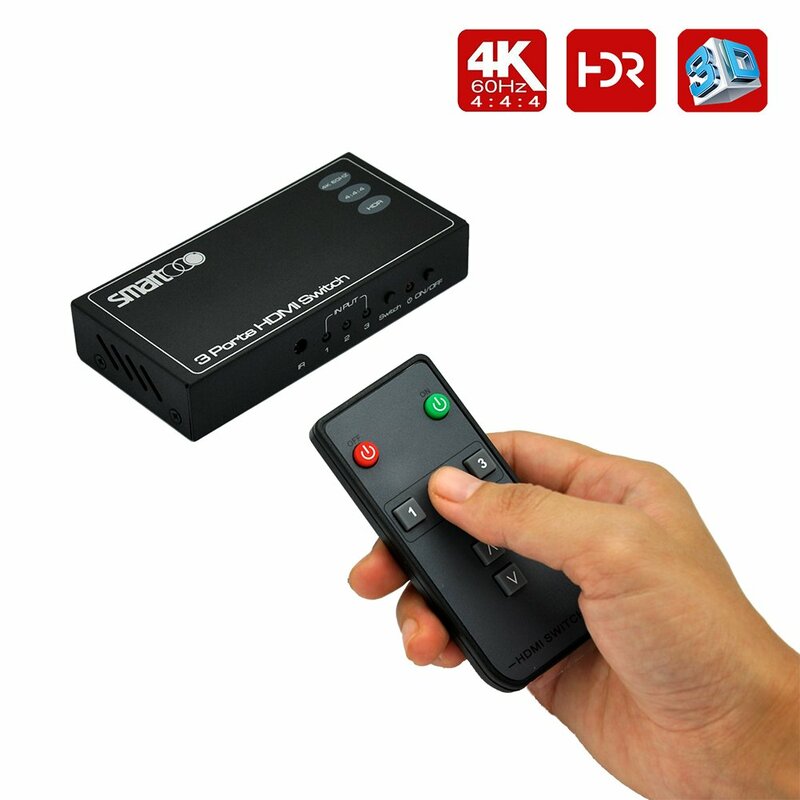 At the same time, the remote control can switch the output HDMI source from the sofa for home users. But since many small remote controls tend to be lost around the house, it is advisable to also consider a splitter which comes with a manual switch button as a backup. Another important consideration to make is with the infrared technology of the remote control. If some users are planning to tuck the splitter away from sight, this might actually hinder the signal from the remote control. It is why the splitter still needs to be placed in a location where the infrared signal of the remote control would reach it without interruptions. Power connectivity Some HDMI splitters need their own power supplies while others use the power from the connected devices. It can be said for sure that one is better than the other. However, some of the best HMDI switchers and splitters come with their separate power cables. It means the splitter needs to be connected to AC power at all times. A few features have derived from the design with a power source. For example, in case of a power outage, the splitter can remember to resume the device in use before the power outage. In other cases, a short power interruption might require users to manually select their desired switch. Constant power also means extra heat production. It is why all HDMI switchers should be kept away from objects which can heat them even more. These can include a TV or any other electronic device producing heat in the vicinity of the HDMI switcher. Here are the answers to some common questions you may have about HDMI Splitters and Switchers. My HDMI switcher is slow, what can I do? Lag is the term often mentioned by users who see a delayed response on their HDMI switcher. Its causes are multiple and in many cases, there’s not much to be done about it apart from ensuring the HDMI cables are of the required quality. Does my device connect to an HDMI TV? If you’re unsure if your device such as a laptop or console connects to an HDMI TV, you can check the device itself or the user’s manual to see the location of the HDMI port. Does the HDMI switcher transform videos to 4K? An HDMI switcher is just a transmitter. It cannot increase the video quality from its original source. How long can I use an HDMI switcher for? Most HDMI switchers are made to be used for hours. This is why their overheating problems are addresses with materials which disperse heat fast. I have a long HDMI cable, is it good for 4K resolution? If your cable is too long, it might lose signal strength on its way to the TV. Users need to check recommended HDMI cable lengths with their splitters of choice. I can’t seem to see the picture-in-picture 4K previews, what can I do? The picture-in-picture function is mainly set to 1080p video resolution at best. Can I leave the HDMI inputs in the switcher at all times? All cables can be connected to the HDMI switcher at all times. This includes periods when the device is not in use. What is the best way to connect an HDTV to my PS4? A PS4 console can be connected to an HDTV directly. In case of multiple HDMI sources, a splitter might simplify the HMDI device map. I love both Xbox and PlayStation consoles, can I connect them to a smart TV? Since some games are unique to these consoles, they can be used together. They can even be connected through the same splitter to avoid changing cables when switching from one console to another. I want to use a projector to watch movies, can I do so with an HDMI switcher? If a projector comes with HDMI connectivity, it can be more than enough to offer a cinema-style movie-watching experience at home. My office has 4 computers, can they be connected to a TV via a splitter? For business purposes, multiple computers can be connected to the same TV source. Splitters might be useful for various presentations. In this case, splitters are only limited by the number of ports and the number of computers they can connect at the same time. Some of the best HDMI switchers are able to offer constant performance with no interruptions. The last thing users expect when immersed in a game is to actually lose the signal from the console to the TV. It is why a reliable HDMI switcher is the only option in most cases. At the same time, most HDMI switchers are affordable. Compared to other peripherals, they don’t require a large financial investment to own flagship designs. It is why most users can purchase a switcher and quality HDMI cables for the best results even after a long period of time. Additional purchases might not be needed for most HDMI switchers. However, many devices which use a remote control tend to ship with no batteries. It is why these batteries might need to be purchased separately. With all of these accessories in place, all HDMI devices can be connected to a TV with the best video and audio quality.